This heel works for any sock knit on a multiple of 12 stitches. 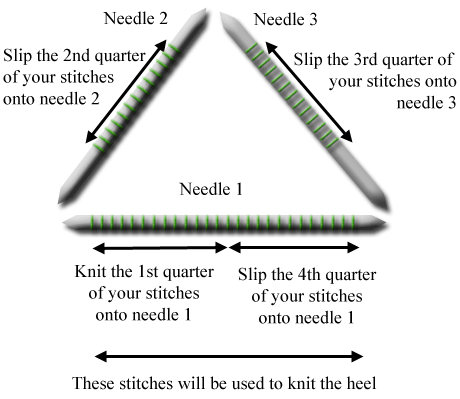 Knit the first quarter of your stitches onto one double pointed needle. Slip the next quarter onto a second needle without knitting them. Slip the third quarter onto a third needle. 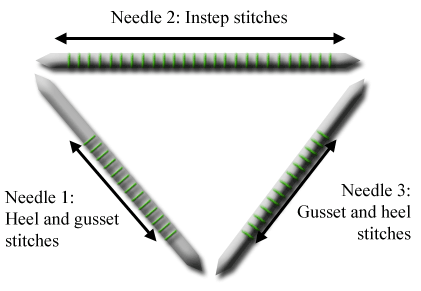 Slip the last quarter of your stitches onto the beginning of the first needle. Next row: Slip 1 knitways, knit to end. Repeat these two rows until you have worked the same number of rows as you have stitches in your heel. For example, if you have 36 heel stitches you will work a total of 36 rows. End having just worked a purl row (work an extra row if you need to in order to end on a purl row). Divide your total number of heel stitches by 3 and place markers 1/3 and 2/3 of the way along your row. You will now be working on the stitches between the markers. Make a note of the number of stitches that you knit or purled before decreasing on rows 3 and 4. You will be working the same number of stitches before your decreases on the following rows. Repeat rows 3 and 4 until all the stitches to the left and right of your heel have been used up. Finish having just worked a purl row. With a new needle (your heel stitches will now be worked across 2 needles), knit the 2nd half of your heel stitches and pick up one stitch for every two rows down the side of your heel flap. Pick up the same number of stitches up the other side of your heel flap. 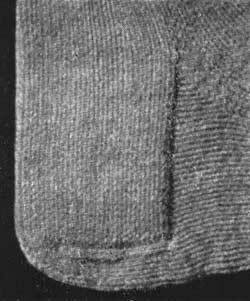 Knit to your end of round marker (the centre of the heel). Needle 3: knit 2, ssk, knit to the end of the needle. 2nd round: Knit all needles without decreasing. Repeat these two rounds until your total number of stitches equals the number you first cast on. Continue with the foot of your sock. Extremely happy to find a VERY clear explanation to sock knitting. Thank you very much indeed! Thank you very much for the instructions!! It really solved all my sock knitting problems!